This Is Your Captain Speaking: Shifting Currents: Will Regional Airlines Survive? Shifting Currents: Will Regional Airlines Survive? It would appear to observers of the domestic US airline industry that things are finally settling down. After years of turmoil, bankruptcy and consolidation, the remaining big four US major airlines control nearly three quarters of all domestic airline seats. Low fuel prices have meant a season of record profits as well. The regional airline market, however, is a somewhat different story. Whipsaw fuel pricing, the introduction of a new class of small jets and a pilot labor shortage along with a reassessment of the relationships between regionals and their mainline partners could be changing the landscape. 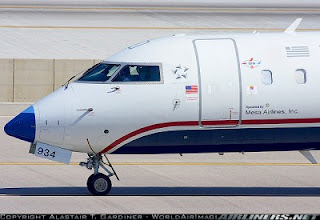 The regional airline business model consists mainly of little known companies such as Envoy, Expressjet or Republic Airlines that fly airplanes in their major airline partners' livery. Flying as American Eagle, United Express or Delta Connection, these companies sign "capacity purchase agreements" with their major partner airlines to provide service between major airline hubs and smaller regional airports that don't support a mainline aircraft. The industry has always existed to ferry passengers from major hubs to small feeder cities, but the introduction of small regional jets from the late 1990s fundamentally changed the dynamics of the business model. These small jets such as the 50 seat Bombardier CRJ 200 and the Embraer ERJ 145 could not only go as high and as fast as their major airline brethren, but could also and more importantly, fly as far. What this meant is that regional airlines could poach passengers from each other's regional feeder airports. For instance, historically, to fly out of a regional airport such as Twin Falls, Idaho, one would have to take a regional airline to the nearest hub which was within the range of the smaller and slower turboprop aircraft. This probably would have been Salt Lake City where Delta was the dominant major airline. The new regional jets (RJs) allowed regional airlines to now fly directly from a smaller city to a hub in another region such as LA, or Chicago. It also meant that regional airlines were no longer strictly feeders to their mainline partners but rather operators of parallel airlines under the same corporate identity. The real brilliance of the arrangement, however, was that the regional partners were not covered under the collective bargaining agreements which kept labor costs high at the mainline network airlines. How did this happen? The one aspect of collective bargaining agreements (CBAs) that unions are most jealous of is their scope clause. A scope clause will delineate which work must be accomplished by employees covered under the CBA and which work, if any, can be outsourced. Obviously unions have an interest in keeping the most work in-house and under the agreement. In fact, unions view scope clause protections as so vital, that those protections are usually set forth in the first section of many airline labor contracts. Thus, the term "Section 1" protections becomes a shorthand for all the restrictions on who may perform work for the company with which the union collectively bargains. It was a lack of imagination and vision on the part of mainline union negotiators that allowed both existing provisions for the outsourcing of regional flying to remain in airline CBAs, or for those provisions to be imposed after the wave of post 9/11 airline bankruptcies. Mainline union negotiators were caught flat footed by the introduction of the new capable RJs which resulted in stagnation in the amount of flying they controlled. They simply didn't think that the provisions for commuter aircraft flying in their contracts would eviscerate their members' livelihoods. In 2000, for instance, regional airlines flew a total of 24 billion revenue passenger miles (RPMs), but by 2010 that number had increased three fold to about 75B RPMs. In the same time frame, all network mainline airlines flying stagnated at about 360B RPMs until 2007 followed by an erosion to about 320B RPMs in 2014. The data can be found here and here. Some, but not all of this mainline stagnation could be attributed to the growth of low cost carriers (LCCs) like Jetblue, Southwest and AirTran airlines, but it became clear that regional airlines were doing a fair bit of the flying that mainline airlines might have done themselves. In 2011 for instance, regional carriers accounted for 64% of all departures at Chicago's O'Hare airport and 74% at Seatac. Some city pairs such as Nashville - Chicago (O'Hare) have had only RJ service while others such as Austin - Denver might have a mix of RJs and mainline aircraft. Three of the largest regional airlines, Envoy, ExpressJet and SkyWest can be even now counted as major airlines in their own right with each having over a billion dollars of annual revenue. What one should be careful to not do, though, is to assume that mainline carriers are in actual competition for business with their regional partners. This is due to the nature of the capacity purchase agreements (CPAs) that mainline and regional airlines have entered into. In a capacity purchase agreement, the mainline carrier simply purchases all the seats on the regional aircraft while retaining the marketing, ticketing, and most importantly, the revenue from the sale of tickets. The regional carrier gets paid regardless of how many seats are filled or how the customer is ultimately treated. The regional airline is effectively wet-leasing its aircraft to the mainline. You can easily see how incentives line up for a less than optimal customer experience on regional airlines...they're getting paid either way. The lack of amenities, spartan service and cramped cabins have made regional jets increasingly unpopular with the traveling public. So if the customer experience is so negative, why do the mainline airlines outsource their valuable branding and operations to third parties who get paid regardless of product quality? Cost control. Salaries are notoriously low at regional airlines with some crew members qualifying for food stamps. In fact, due to the long term contracts regionals have with their mainline partners, the only way for a regional airline to increase unit revenue is through cost control and cost reduction, which is exactly what they've done and become very good at. So who wants to work at such a place? One of the reasons that employees may accept the low wages offered by regionals is that hiring standards are lower, or perhaps employees hope to gain needed experience in the industry in hope of landing a better job at a major airline. This is especially true for aspiring pilots who can count their flight hours as a form of pay. Most mainline airlines have minimum hours requirements for pilots to be considered for hiring. The only way for a young pilot to get this experience other than joining the military has traditionally been to fly for a regional airline. New federal regulations, however, are changing that dynamic which I wrote about here. The arrangement between regionals and mainline carriers has many of the usual suspects and social justice warriors in a degree of moral high dudgeon due to low wages, but my view is somewhat moderated. It's simply not true that forcing wages higher will result in a greater quality product while leaving service distribution unchanged. In many cases, smaller cities will just lose scheduled air service as costs climb. This is already happening. The regional industry has several other vulnerabilities which may eventually change how they do business. One particular achilles heel is the high seat-mile cost that the small jets have. While the cost to acquire and operate a 50 seat jet is only marginally less than say a 737, a 737 will have nearly three times the seats and therefore three times the ability to generate revenue. After huge fuel price spikes in the late 2000s it became apparent that the economics of the 50 seat jets didn't really work. As a result, many of those jets are being traded in for the larger 70 and 90 seat versions. A new generation of small jet such as the Embraer E series and Bombardier C series of jets feature larger cabins, first class seating and are as comfortable as mainline Boeings or Airbuses. Now though, with the larger capacity aircraft, regional airlines are bumping back into union contracts which restrict the outsourcing of aircraft of larger than 90 seats. Coupled with an ongoing pilot shortage, at least two mainline carriers, Delta and United, have considered bringing their regional airline operations back in-house. Last summer, Delta proposed to their pilots a purchase of 20 Embraer E-190 regional aircraft and United recently approached their pilot union with an offer of increased pay which included the introduction of either the Embraer or Bombardier 100 seat aircraft. While Delta pilots turned their offer down for unrelated issues, pilots at United have yet to vote on the new pact which also includes pay increases. It seems apparent that with the pilot shortage driving higher pilot salaries, the advantages of outsourcing regional aircraft flying to a third party where customer service may suffer is being outweighed by keeping the flying in-house. The regional airline concept grew as a response to competition from LCCs after deregulation, and from new powers given major airlines over labor by a change to the Railway Labor Act in 1981. Had the majors not grown these ultra-low-cost partners, and kept control of them with capacity purchase agreements, the majors would have lost the battle. The LCCs were crushing them in small markets everywhere. Regional and ULCC airlines are losing pilots quickly, they might last another couple years in their current form. What happens next will be the real excitement. The major airlines will see their networks crippled, while smaller U.S. LCC airlines will do well and be poised to take advantage of opportunities. This could go very badly for the major airlines, and the pilot supply will be the key. Pilots are major airlines are operating under onerous contracts, pay is modest, conditions are grim, and quality of work life is suffering. Major airlines are still cutting every cost aggressively and desperately. Smaller LCC airlines are becoming pretty good places to work by comparison, they treat their workers well, and pilots advance quickly to higher positions. There are a large number of pilots at smaller airlines who chose not to go back to the majors when they were recalled from furlough. That is important. Major airlines are not poaching any significant number of pilots from the smaller airlines, they are almost exclusively coming from regionals. The majors are cannibalizing from their own networks by doing this, damaging the one thing they still have of value. The majors are easily hiring over 3,000 pilots/year from the regionals, which have around 16,000 pilots left. The unknown and very important question is: will the majors be able to hire from the big LCC with such ease? If not, the majors are in real trouble. Thanks for the kind words. Yes, I'll be getting the popcorn as this show promises to be a good one! From my perch, it appears that pilots will go where there is the fastest upgrade along with the greatest odds that the airline will stay in business. Right now it appears that American looks good as all the USAir East guys will retire soon. Virgin has a quick upgrade and deep pockets mean they're in it for the long run. Southwest is printing money right now but their upgrade times are pushing 15 years which is a drawback. For current regional pilots with 2000+ turbine hours, the world is their oyster. It's nice to be wanted.